Our user-count needs improvement, but Gadgets represented two months (plus?) 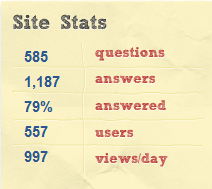 of public beta; we're at only three weeks, and users keep getting added. So no worries. Our views/day is dropping? Does anybody have actual stats tracking, instead of these two, random snapshots? What do we need to do to help avoid the fate of Electronic Gadgets, and wake up one morning to find all of our content was ported over to Programmers in the middle of the night? We should email a some of the big Android Blogs an let them know about Android.SE, invite them to join and share their expertise and encourage them to share it as a resource to their readers. I was going to just do it but maybe we should discuss a game plan. We might also find great benefit in sharing this with Motorola, Samsung, HTC, etc. on-line communities and forums. I think it would be a great opportunity if we started sharing answers, links, etc. at these places! The idea would be to attract users without harming what they have going on already. What's the best way of doing this? Any other suggestions? One way to help us reach the suggested goals is to keep on voting. We've each got 30 votes per day -- let's use them! Is it possible to buy sponsorship/ads on Android podcasts or websites? Does StackExchange give the communities any sort of money to do such a thing? This meta.SE questions seems relevant. Another thought: I alway link to Appbrain for apps and I'm not going to stop doing that but if you find a solution on another website like Lifehacker, putting a link to the article would be a good idea. If those sites start getting referrals from android.SE and/or see the back links they may take notice quicker.